Catching Up With Food Trucks. This is a guest post from Sportservice Regional Executive Chef Kevin Doherty. There is no denying that one of the newest trends in the culinary world is the emergence of food trucks that sell global cuisine. It seems that food trucks are popping up all over the country and having great success. 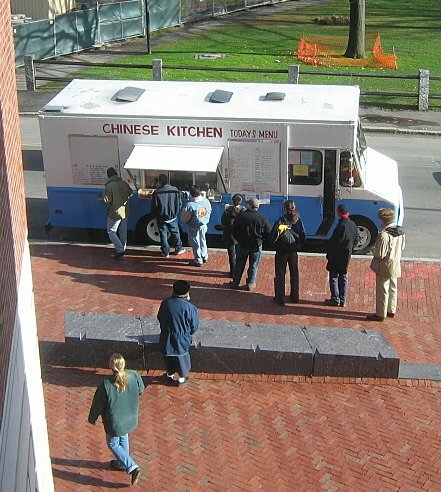 I did a quick Google News search of food carts and learned the following: A late night food cart has been approved in Massachusetts; an organic food cart has been approved in New York City; there are now more than 500 food carts in Portland; and there are food carts in San Francisco now starting to sell cocktails. All of this news about food carts was all from the past 24 hours. I have many theories on why this is becoming a popular trend. Most importantly, it fits our busy lifestyles as it enables people who are working or hurrying home from work to grab something quick. It also works best in densely populated areas, where most U.S. residents live. It’s also new to the American palate and popping up on street corners everywhere. Food trucks are very popular right now. I experienced the phenomenon personally a few weeks ago when I ate at a vegan food truck at MIT in Cambridge, Mass. The line was more than 100 deep but it was moving faster than what you’d see at Burger King. It was amazing. Plus, most importantly, the food is fresh. I ate a falafel with pickled cabbage, carrot and cucumber in a whole wheat pita…all for $5. Now I’m hooked. I have apps on my phone that track specific trucks as does Delaware North Companies Sportservice President Rick Abramson. Every time I travel I look for a new cart to check out. And, with the popularity growing, it seems every time I come home to Boston there is a new cart with new food to taste. Honestly, it’s one of my favorite trends in the culinary world in quite some time. It’s introducing people to all new types of foods – Mexican, Jewish, Vegan, etc. – And it’s just neat. It’s great to see this idea really changing the way we eat as a society. This entry was posted on Monday, September 20th, 2010 at 2:04 pm and is filed under Uncategorized. You can follow any responses to this entry through the RSS 2.0 feed. You can leave a response, or trackback from your own site. One Response to Catching Up With Food Trucks.